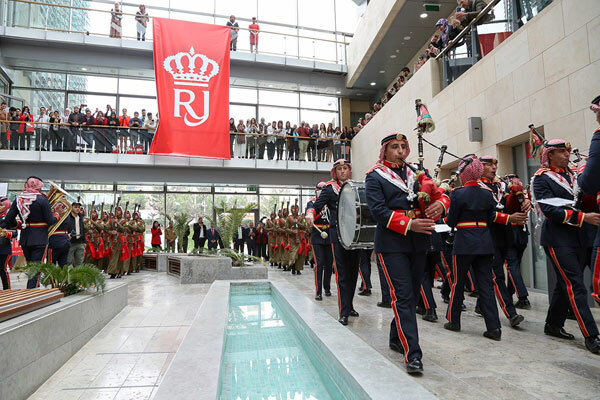 Royal Jordanian (RJ) has commenced festivities to mark its 55th anniversary on December 15, with the Jordanian Army Band performing various national musical pieces and shows at the head office in Amman on Wednesday (December 12). On the occasion, president/CEO Stefan Pichler expressed the airline’s appreciation for the care the kingdom and the Jordanian government give RJ, and for their keenness to maintain RJ as Jordan's carrier. “RJ has been successfully achieving the set goals of the turnaround plan; proof of that is the net profit in the first nine months of 2018, which reached JD10.2 million ($14.3 million),” Pichler said. He added that RJ has all the ingredients needed to be successful and move to a brighter future. He noted that RJ will keep improving its services, facilitate travel procedures and develop employees’ skills by training them according to the best customer-service standards, in addition to relying on technology in all fields, in line with international airlines. Pichler said that the strategic objective of Royal Jordanian is to position itself as the No. 1 carrier in the Levant. This will be done by strengthening the three main pillars of the five-year turnaround plan: sustainable profitability that attracts the capital market and targets increasing operating margins in the coming five years; being a consumer champion by thinking of customers first; being the employer of choice, which attracts and retains talented and skilled workforce and rewards performance. The airline keeps revisiting its route network to enhance connectivity through RJ’s hub in Amman and will simplify the fleet and thus make future growth easier. Pichler added that RJ will keep offering super-low fares to retain loyal customers and gain new ones; passengers will also see improved services and a seamless travel experience. In 1963, the company had 250 employees, operated two aircraft -- a Handley Page Dart Herald and a DC7 -- and was flying to three destinations: Beirut, Kuwait and Cairo. Now its fleet counts 26 modern aircraft that fly to 45 cities spread over four continents. The next five years will see the launch of new stations, the renewal of short- and medium-range fleet and the addition of three to four new aircraft, which will bring the total number of aircraft to 30. The number of passengers have increased from 87,000 in 1964 to 3.250 million by the end of this year; and the number of yearly flights grew from 4,000 to almost 35,000 over the period. Revenues also went up from JD1 million ($1.4 million) in 1964 to JD660 million ($930.8 million) expected at the end of this year.